The track beneath my tires wended its tortuous way through the foothills of the eastern Sierra Nevadas. Other vehicles shared the road, some taking corners on two wheels, others crawling with too much caution. I chose a moderate approach, passing drivers with hands locked on steering wheels but giving way where possible to the restless herd behind me. Vehicles accelerated past, churning loose gravel as they hurtled through space and time, the drivers giving little regard it seemed for sanity. You had only to look into the ravine below to understand the dread of the slower drivers. I didn’t want to wind up there either, although the drop was less deep than many I’d encountered while driving through Yosemite National Park yesterday. At least today cars weren’t barreling towards me head-on in the middle of a narrow two-lane road with certain death mere inches from my tires. I'd arrived last night at the safety of the hotel on a wing and a prayer and possibly the last of my shredded nerves. I’d once visited this place as a young child on a family trip and had come away with the impression of sun-bleached buildings, scorching sunshine, and an abiding sense of history. Nothing seemed to have changed in the intervening years. Buildings over a hundred years old still baked in the heat of a sun that necessitated the application of sunscreen and repeated gulps from our water bottles. There was much to see, far more than we could possibly take in during the hours available for our visit. Many of the houses had been abandoned with the furnishings and paraphernalia of daily living intact, right down to wire hangers in the closets. Antique litter strewed the ground--the remains of a washbasin lay in the open, a rusting bucket sat beside a house, and a mining cart crouched in the grass. Ancient litter strewed the ground. 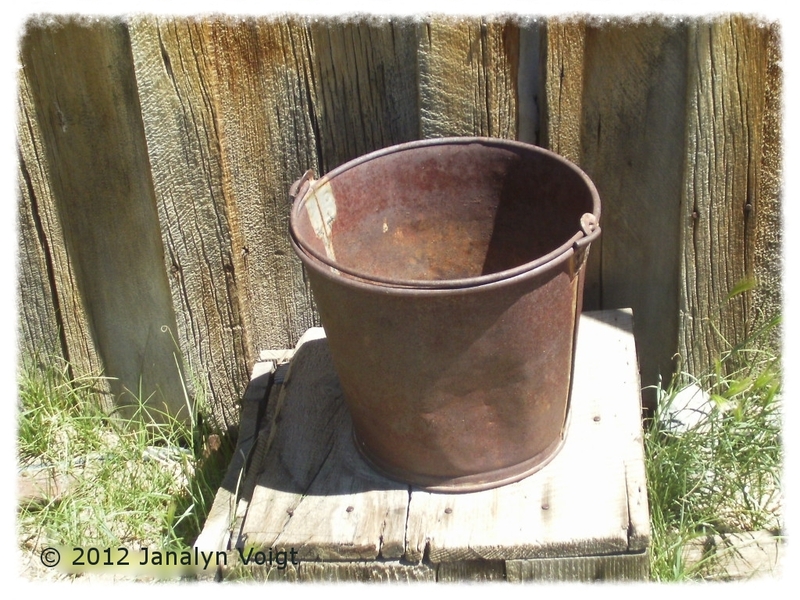 Metal bucket beside a house. 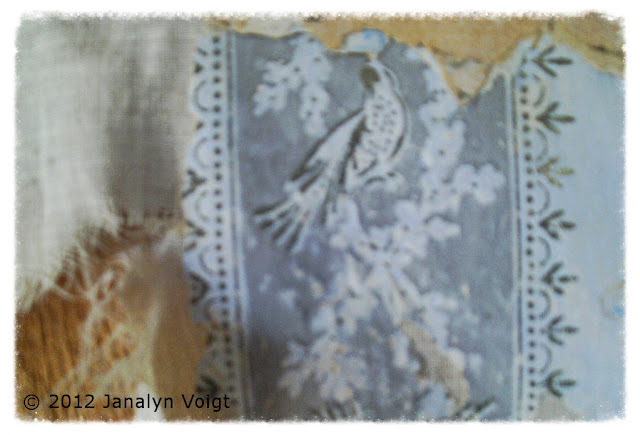 Peering into windows revealed peeling wallpaper, coverlets on beds, and an antique potty chair. Tweet This! I peered into a brick strongroom and gasped. 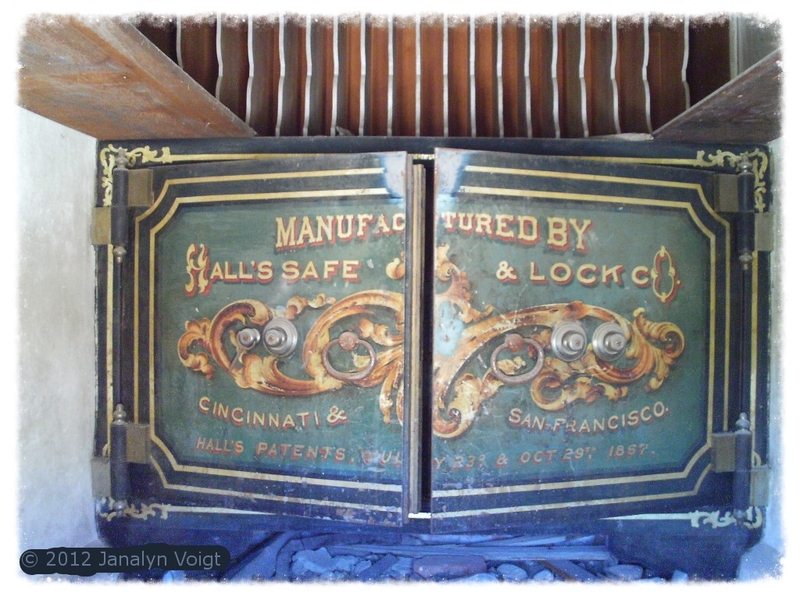 The safe inside had miraculously escaped decay. I put my arm through the grating to snap a picture of the safe still within the building. How many visitors have missed this discovery? And yet there was much we lacked time to see. Although only a fraction of the original buildings still stand, Bodie stretches into the surrounding hills with a scope that boggles the mind. Tweet This! A bed made up and waiting. This safe is one of the hidden treasures that awaits the alert. 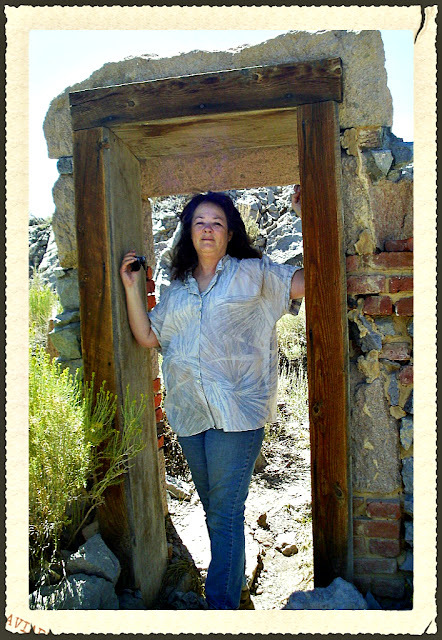 I posed for pictures in the doorway of a crumbling structure. When a sharp buzzing sound alerted me to wasps or bees, I left it in haste. 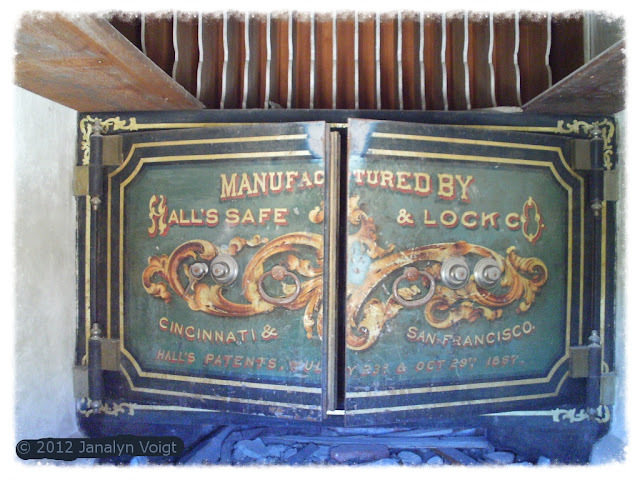 Although much of Bodie has fallen to nature, the remaining buildings boast details such as carved doors and tin ceilings and are preserved in a state of arrested decay. This means that roofs and windows will be replaced as needed and standing buildings will not be allowed to collapse. 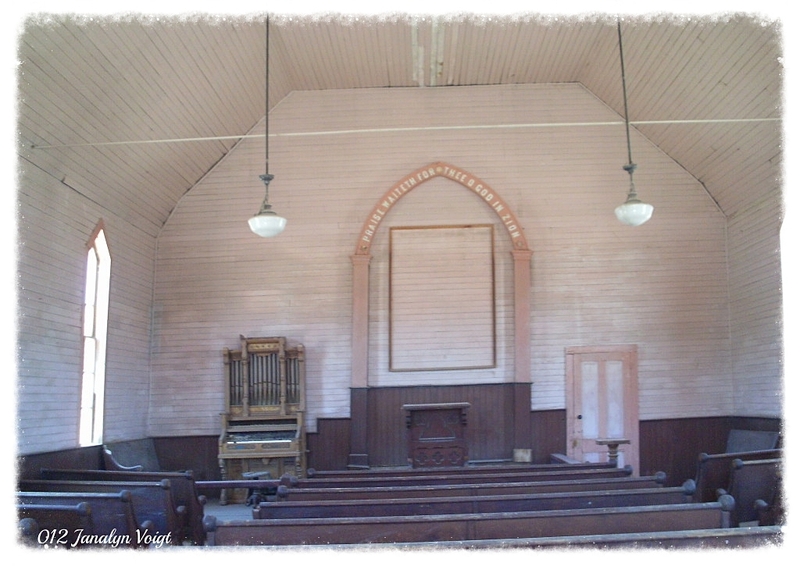 Bodie is preserved as a ghost town museum. Tweet This! I had to wonder how anyone could survive living here in the innervating summer heat, let alone the winter cold. Although most of the structures we explored were locked, we grew adept at ducking into their waning shadows for relief from the merciless sun until empty water bottles and the wails of our youngest member, aged two, drove us to the former miner’s hall, now a museum and visitor center. Inside among other surprises waited two hearses, presumably employed often in this rough and ready mining camp. The west was reportedly wildest here. And yet, on the way back to the car for the arduous return journey, we passed a church. God apparently followed that little girl to Bodie. This post has been brought to you by Janalyn Voigt. To see more pictures from Bodie and read the travel journal Janalyn wrote at the time she visited Bodie, go to Ghost Town in the Shadow of the Sierra Nevadas at Janalyn Voigt's Fantasy Worlds site. Receive updates from Janalyn's research and travels absolutely free by subscribing to the Creative Worlds newsletter and/or blog. 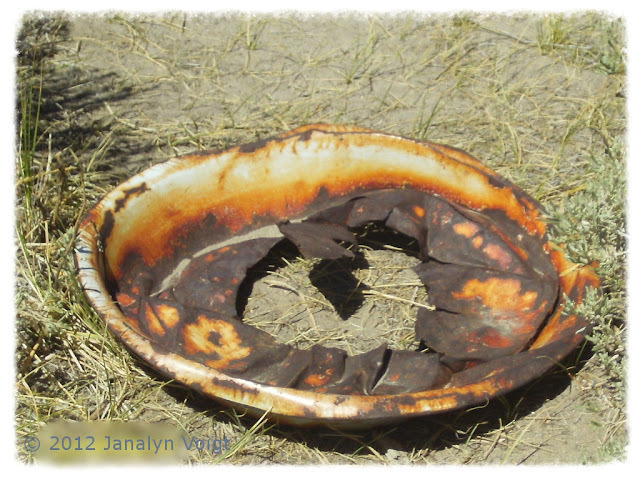 As a bonus gift, you'll receive access to three of Janalyn's original photographs for use as computer wallpaper. Sign up is easy and secure, so don't hesitate. Click here to escape into Creative Worlds! 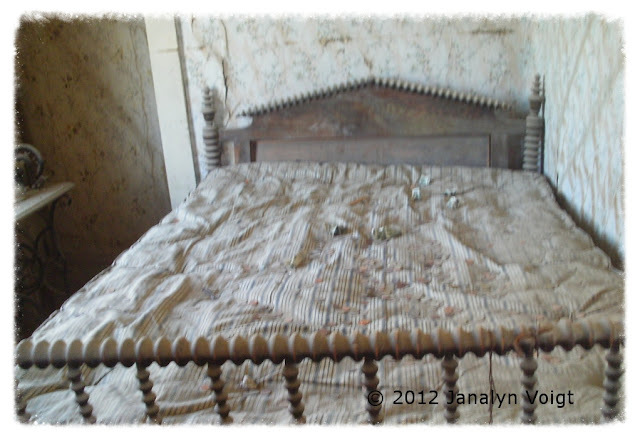 Thanks for the glimpse into Bodie Ghost Town...God bless. Debbie, Bodie was renowned for bad weather, being blazing hot in the summer and freezing cold in the winter. I like temperatures in the mid-range best, but the visit was well worth the discomfort. 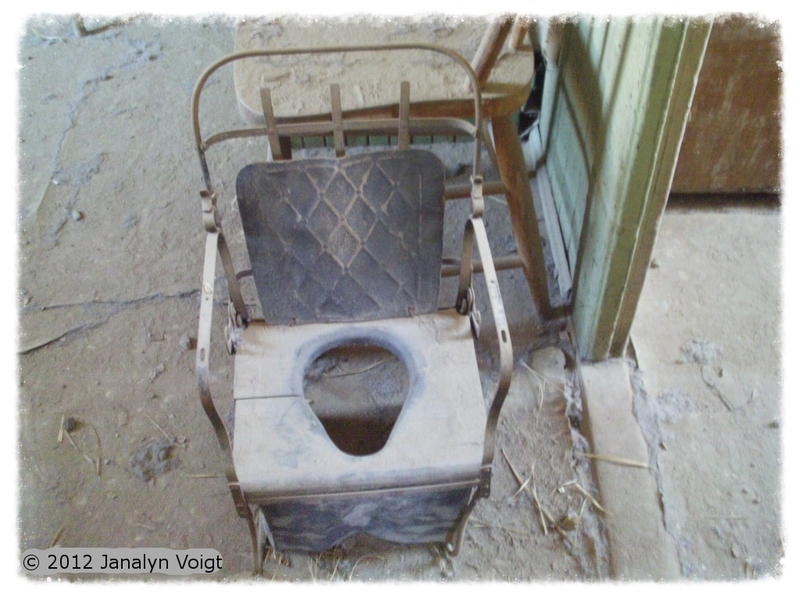 Bodie looks like a great place for a historical writer to visit. The pictures were wonderful. I was curious about the lights in the church. Do you think those were added later? I know some gold mine towns like Leadville, CO, had electricity very early on. Did Bodie? 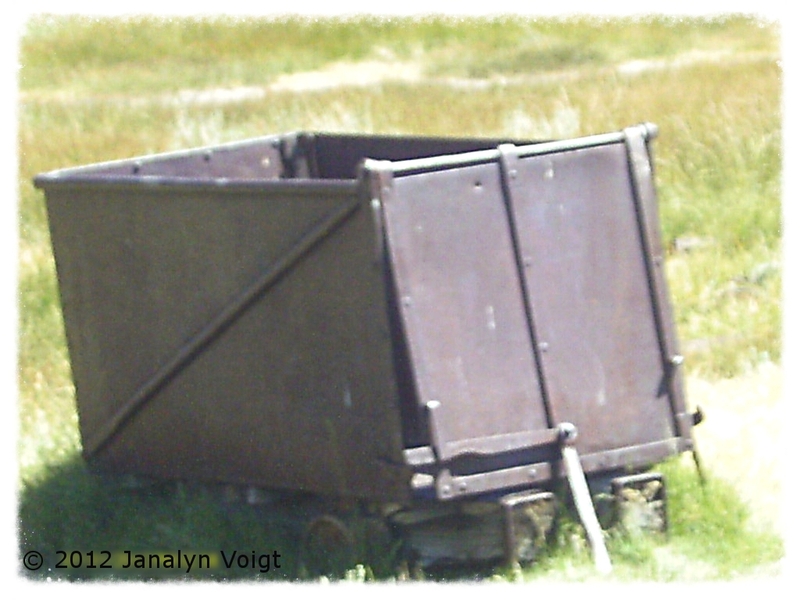 Vickie, Bodie began its decline in 1912, but people still inhabited it. The three last residents (one of them the town's caretaker) were recorded in 1943. 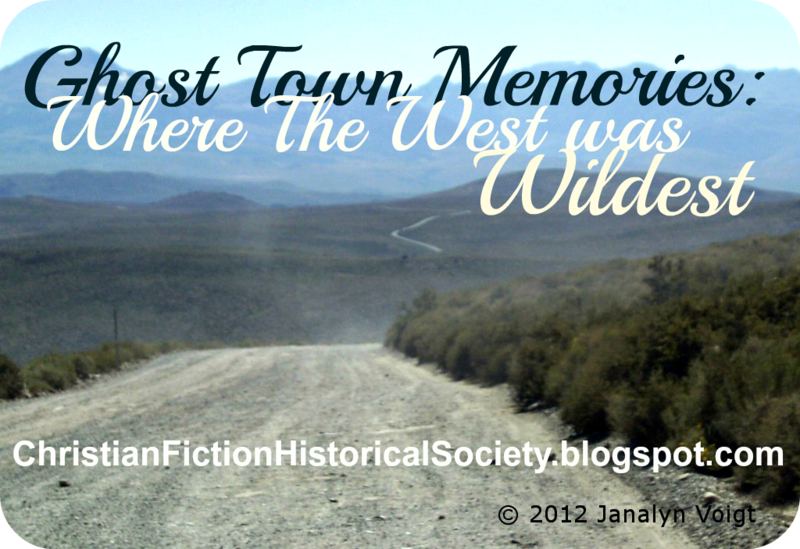 I focused on the town's wild west beginnings in this post, but I also have a picture of a leaning electrical pole and of houses strung with electrical wires. Thanks, Sara. I enjoyed sharing them with you. I love your last line! "Whither shall I go from thy spirit? or whither shall I flee from thy presence? If I ascend up into heaven, thou art there: if I make my bed in hell, behold, thou art there." Psa. 139:7,8 Even in Bodie! 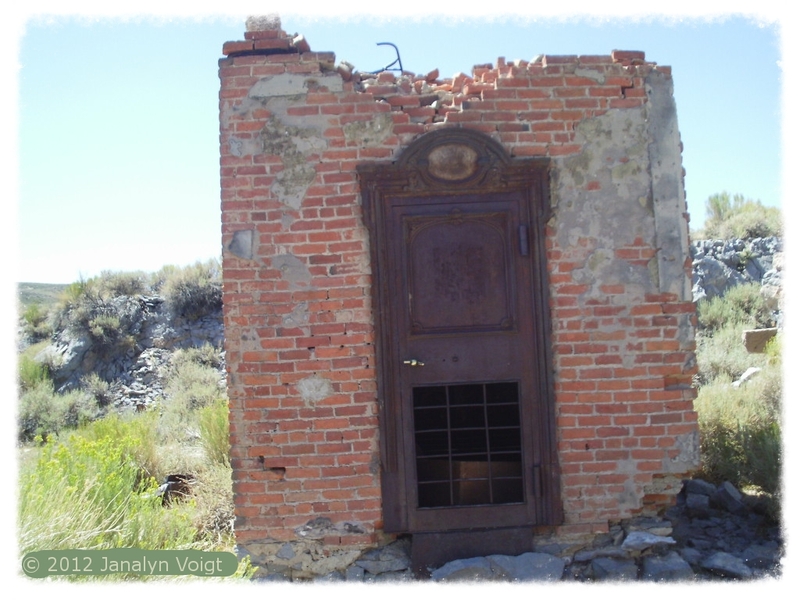 Bodie is a reminder of the end that evil men and their deeds come to - nothing left but ruins. So thankful for Christ Who offers the way of escape! Bethany, thank you for sharing such beautiful thoughts. I love that the church still stands in Bodie despite most of the buildings having vanished. Wow! A veritable time capsule. Thank you for braving the heat and bringing it to us here, Janalyn. Your photos were terrific, and your narrative shows us through the lens of someone who truly appreciates historical detail. You're welcome, Kathleen. Like many historical authors, I feel a God-given responsibility to record the past. Thank you for this post. I enjoyed it so much I am headed over to your sites to sign up. I love ghost town stories. Thank you for including pictures. Thanks, Angela. I'm glad you enjoyed my post and pics. Thanks for sharing all of these wonderful pictures with us. I especially enjoyed the one of the hearse - what a fascinatingly ornate vehicle for such a rough town. I had that same impression, Winnie. 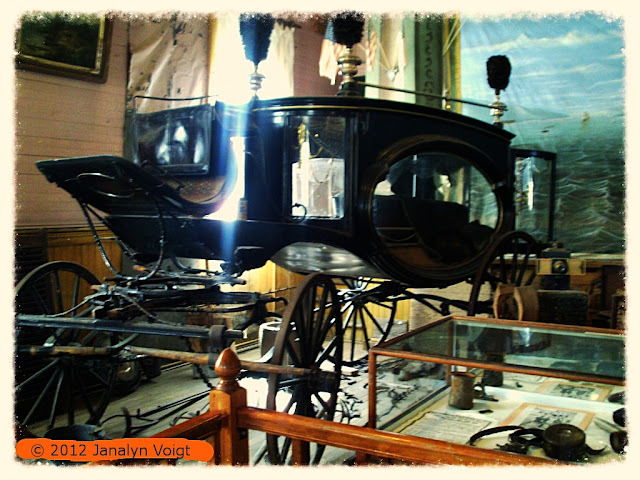 I hope someday you can visit and see the hearse in person. Pictures fade in comparison. Thank you for taking us along to Bodie. I've never been to a ghost town and this was very interesting. It always amazes me that these towns are still with us. I'm so glad that it is preserved as a museum and it appears that it has not succumbed to being a tourist trap. I would love to visit someday. I hope you find a chance to visit Bodie, Kat. While they have their place I don't much care for tourist trap ghost towns. I'm glad Bodie is still the genuine article. I always enjoy stopping by and seeing a little more about the ole west or just plain history of things I had forgotten about. love this new site and meeting some new folks. thanks for your imput today, like the pics. It always seems so romantic weaved into a story but I am thinking that living it would have been pretty hard to do. I find ghost towns & the old west intriguing - but am thankful I didn't live in that place & time, I am too contented with modern conveniences. I am one of those extra cautious mountain drivers that you mentioned - was terrified while driving on the narrow, winding, mountain roads in western Colorado several years ago! The little town in Ks. where I lived when I moved to TX. is in the Ghost Town Books, Elgin, KS. It was a bustling town back in the cattle drives and this is where they came to put their cattle on the train. There was some rough people there too. Where I lived across the street from us, was a big dip in the pasture. That was where the big vat was that they had to drive the cattle through to kill any ticks picked up on the trail. At some point they refused to let a highway go through town, so when it went to another town, the town died. Mostly who live their when I lived there were oldtimers who grew up in that area. And the only business was a small Cafe. But, I liked it.